The ideas behind this unusual and very practical urban tool resemble a knife design from Becker Knife & Tool, now a part of Ka-Bar. 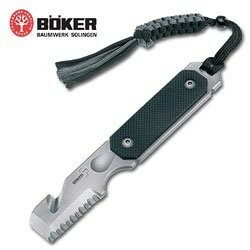 The Boker Plus Cop Tool uses concepts similar to a tactical tool Becker designed for police SWAT teams. It's more tool than knife and makes an excellent urban survival kit for civilians in this more compact form. Developed for Boker USA and Wilson Tactical by 20-year veteran police officer Roy Huntington, the 4.2-ounce knife offers prybar strength and many application options in a simple 6-inch-long belt knife style. The Boker Plus Cop Tool comes with a leather belt sheath, which attaches easily to other gear or stores in the car for emergencies. The serrated cutting edge quickly saws through seat belts and shoulder harnesses, and handles ordinary cutting chores. The squared chisel point of the high carbon stainless blade slips into crevices for levering apart jammed doors and wreckage or stubbornly chips away at obstacles. For quick cord cutting, use the notch in the spine of the blade. G-10 handle scales give the knife a non-slip textured grip that holds up against chemical solvents and stays tactile when wet. A finger choil gives extra purchase when slicing, and a hollow in the base of the blade fits the thumb when using the flat edge of the knife's point. A notch in the handle fits the valve of an oxygen tank. Exposed metal surfaces are bead-blasted to reduce shine. Thick high carbon stainless steel and one-piece full tang construction make this a versatile no-fail tool for any urban traveler. For a larger knife with similar features, see the Ka-Bar Tac Tool.